"Burlesque Republic offers a unique insight into Germany's blooming Burlesque scene and introduces the reader to 49 of the finest Burlesque performers across the country. Not only do you get to see the performers in full costume and on stage, but also backstage and in private. The foreword by Berlin's Burlesque-Mama Lady Lou explains what this art form is all about, and in an exclusive interview the famous costumier Hedoluxe talks about the mysteries of the Burlesque costume." 128 Seiten, 17,5 x 24,5 cm, Hardcover, Titel foliengeprägt, Texte auf Englisch. 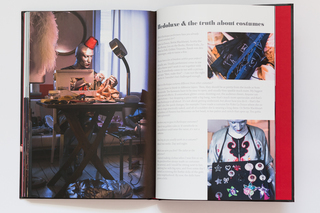 CLICK "Jetzt kaufen" TO ORDER YOUR COPY OF BURLESQUE REPUBLIC! All Texts are in english.